The 52 defence consists of a halfcourt 1-2-1-1 that evolves into a 1-3-1 after one pass (or they can line up directly in the 1-3-1). 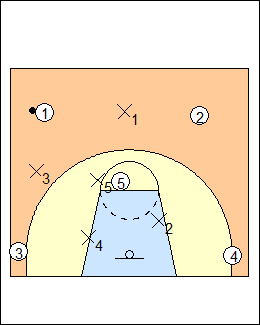 54 is a fullcourt 1-2-1-1, 53 a 2-2-1 (both go back to man-to-man), 51 a 1-2-2. 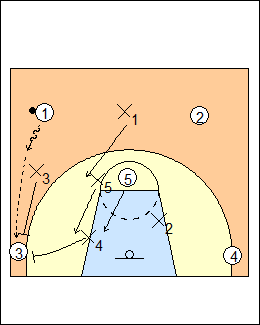 See Defences - 1-3-1 Versoix, 1-2-1-1 Tennessee, 2-2-1 UConn, 1-2-2 slider halfcourt. X1 is in the point position near the 10-second line, X3 and X2 are high on the wings near the hash marks, X5 is just above the top of the key, X4 is the goaltender. Play for one double-team, X1 and X2 double-team 1 the moment he crosses halfcourt, X5 and X3 are the interceptors, X4 protects the basket or cheats up on the double-team. If they don't get an interception, the defence moves to a 1-3-1 alignment. 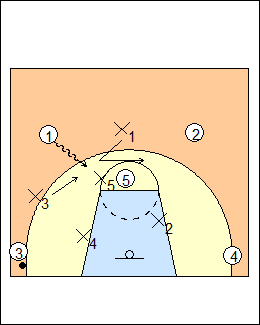 A 1-3-1 passing-lane zone forces lob or bounce passes, with double-teams. It is easiest to put X5 and X4 in the posts (with best rebounder X5 in the middle, X4 on the baseline), X1 at the point, and X3 and X2 at the wing positions, just like their 1-2-2 defence. To bother the important guard-to-guard pass, it helps if X1 is tall, and if the offence consistently brings the ball up one side, it may be preferable to have X3 on the other side for rebounding. X5 faces the ballhandler and stays between the ball and the basket. Baseline defender X4 stays low in the lane until the ball is passed to within 6 feet of the baseline, then comes out to cover. 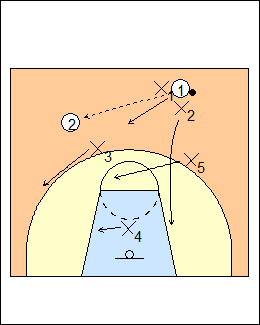 On a pass to 2, X2 gets quickly into the passing lane between 2 and 4, X1 turns to face 2, X3 moves quickly to the lane, X4 moves to the other side of the lane, X5 stays between the ball and the basket. 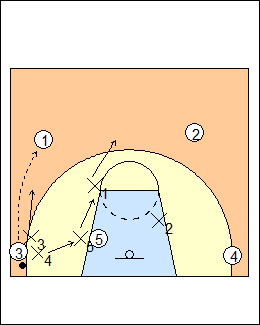 On a pass to the corner, X3 and X4 double-team (the pass should be a slower lob or bounce pass), X5 fronts the low post, X1 covers the high post. 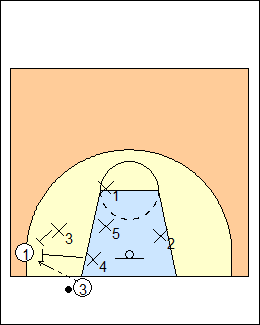 For good rebounding coverage out of this defence, X1 must move quickly on a shot to rebound on the weakside. 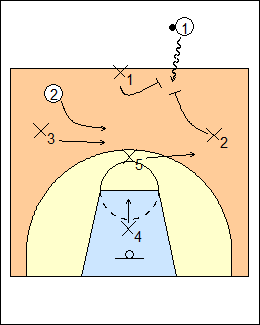 X1 can leave the high post to block a pass to 1 (and should do this if 3 turns to face the sideline), then X2, who is watching X1, comes over to cover the high post. This optional move by X1 should be used sparingly, if the offence expects it they will counter with a cross-court pass. On a pass to 1, X3 sprints into the passing lane, X4 sprint offs to the lane, X1 jumps into the passing lane between 1 and 2, X5 stays between ball and basket. Clogging the passing lanes invites dribble penetration, X5 and X1 fake at 1, X3 is designated to stop the dribble and stay with him. 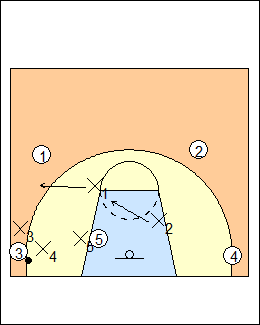 The 1-3-1 can be used to defend a baseline out of bounds, X4 is on the inbounder and double-teams if the ball is inbounded within 6 feet of the baseline, or otherwise moves into the lane.